Power on/off button is located too close to the Lullaby Mode button. Foscam has been traditionally associated with developing IP based cameras, which are perfect for high quality remote monitoring of your home or your kids or your office. Their cameras are known for their powerful capabilities, innovative technology, ease of use and affordability. Foscam builds IP cameras which can connect over the Internet or Local Network and provide you with a live feed of any place you want to monitor from away. 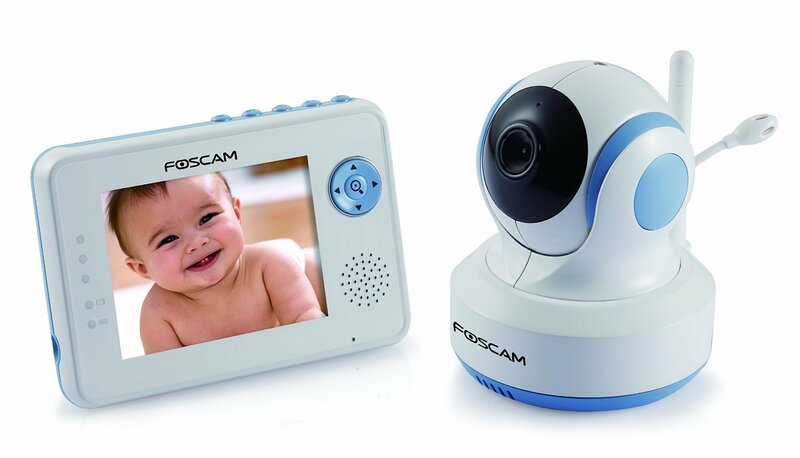 The Foscam FBM3502 is another addition to Foscam’s growing repertoire of high quality network cameras, which has been introduced in the market as a baby monitoring device although it can be used for keeping an eye on your pets and your home/office in general. Apart from its basic feature of monitoring your baby, the Foscam FBM3502 camera has so been designed that it is able to track every movement in its range of view or direction. There is also an option to zoom in to see even the smallest details and another feature that enables you to communicate with your baby over the camera! 1. Digital FHSS Technology – The 2.4 GHz Automatic Frequency Hopping System ensures that the audio/video transmission remains secure, private and free of any kind of interferences. This technology is particularly useful for families who live in an apartment where the chances of picking up interferences from other monitors and electronic devices is very high. The FHSS technology uses several frequencies over which the audio/video transmission is carried upon, and so there are no chances of any loss of audio/video transmission while monitoring. 2. 3.5″ High Quality Colour LCD – A crisp LCD display allows up to four monitors to be viewed on its screen when using the “Expandable View” feature. It also has remote camera controls built into it, which can be used manually to control the camera or cameras deployed in your kids’ rooms. There is an additional “Video Off” function which allows you to choose when to shut off the monitor screen. This feature is especially useful in cases where a false movement or sound alarm activates the monitor screen thus, disturbing your sleep. 3. Long Signal Range – The Foscam FBM3502 has a longer than average signal range of 985 ft in an unobstructed place. This means you can communicate with your baby or monitor him/her from anywhere in your house easily. The only exception is when there are thick or multiple layers of walls between you and the baby, which is a pretty uncommon thing in modern houses as they usually have walls made of wood or thin sheet rock. 4. Hands Free Motion Tracking – Use of advanced motion sensing technology in the FBM3502 monitor allows the camera to track and follow your baby’s movements across an incredible 270/120″ wide pan and tilt range. This feature saves you the trouble to keep adjusting the camera every time your baby goes out of focus. 5. Two-Way Communication – There is a “Talk Back” button which allows you to initiate a two-way communication with your baby from anywhere in the house. So there is no need to use any substitute or pre-recorded voice to comfort your baby, if needed you can talk to him/her any time you want! 6. Enhanced Auto Night Vision – The FBM3502 uses eight non-visible IR LED lights which are turned on if the camera detects low ambient light automatically. This allows you to keep an eye on your baby even in the dark, without disturbing his/her sleep. The monitor also has high intensity diodes which are responsible for night vision capability in the camera and help to produce a much better video quality (30% better than other models), in virtually any level of darkness. 7. Four Hour Battery Life – With standard rechargeable batteries it can give a runtime of about 4 hours, however if you are using high capacity batteries, you can even extract up to 6 hours of monitoring time from the camera. There is also the option to plug in the monitor in case you are going to use it for a longer period of time. The baby unit of the monitor is advised to be always plugged in so that you don’t have to get up and walk to baby’s room to change the batteries or plug in the charger. 8. Additional Features – There is a feeding timer built in the monitor which helps to remind you when it is time to feed your baby. A temperature sensor is also available which collects the temperature data for the room in which it is kept in and helps you to make sure the room in which your baby is sleeping remains sufficiently warm or cool, as required. Power on/off button is located too close to the Lullaby Mode button, chances are high that you might press the wrong button in the dark, and thus wake up the sleeping baby! The Foscam FBM3502 is a good value for money, and a reliable product with easy to use features that promise to make life easier for parents. The parts and technology used in the monitor are high quality and the various innovative features make it an ideal device for using as a baby monitor. Ample safety features combined with a reasonable price make it a good investment. However, a little upgrade of adding the IP connectivity feature would have gone a long way in attracting parents who have to stay away from their homes a lot, and have to depend on the Internet to interact with their family and kids especially.